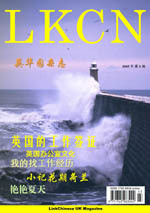 The third issue of LKCN Magazine, published in July 2005, discusses the current UK working visa system and the recently proposed immigration bill (Making Migration Work for Britain) and its implication to the more than 80 thousands Chinese students, professionals and young immigrants, whom we call the new generation of Chinese. Most of the Chinese students have expressed the interest of working in the UK before going back to Chinese. Overseas work experiences are increasingly desirable in China, with which the employibility of the Han-Guis, nickname for "Coming back from overseas" would be greatly enhanced. However the current UK working visa system is very complicated. Besides the most frequently applied Work Permit, there are also TWES, HSMP, SEGS, the newly launched FT:WISS, dependent or spouser's visa, and ILR. Whether the propsed five-tier point system would simplify the working visa system remains to be seen, however. Britain has certainly become a popular destination for Chinese students. Meanwhile, more and more Chinese graduates have be back to China. In this issued we interviewed a London School of Economics and Political Science graduate, Karen Zhang, who has found a job in Burson Marsteller PR firm Beijing office after getting her MSc from LSE. The experiences of studying in LSE and the projects she had done during the study gave her enomorous advantage, which helped her land this job. If job hunting is difficult enough, to adapt to the working environment of British companies is no less a challenge for Chinese students. In this issue, we invited four graduates to discuss their experiences of preparing CV, interviewing, and their views on British office culture. They talked about their enjoyment, (mis)understanding and sometimes bewilderment when working with their British colleagues. A new column is launched from this issue. Buzzword is about the current buzzword in British media and popular culture. This is not only for learning English, but also for Chinese to better understand the current affairs and cultural trend in Britain. The usual columns include European travel, IT and computing, fashion, and cooking.